Yeah I know it's been a while since I last blogged. I think I am hit with the sleepy sickness. Perhaps it's the season, especially now that the days here are getting much shorter. Pretty soon we'll be having the arctic darkness again which I usually embrace because I thrive creatively during the winter months, however, I think this is the first year since having moved to the north of Norway that I am feeling the effects of the approaching season. I could take countless naps throughout the day. I think I might have to pull out my daylight lamp again and see if that will help. I have however been very busy in my studio. I am almost caught up with all of my custom orders and will be able to spend some more time behind my messy bench. 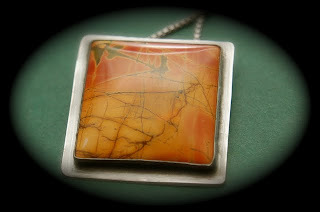 I am waiting on some gorgeous Picasso jasper cabochon and beads that I'd like to incorporate into some earrings. I hope they'll get here in the next couple of days so I can start filling up the shop. I will be offering some smaller and more affordable items as well. 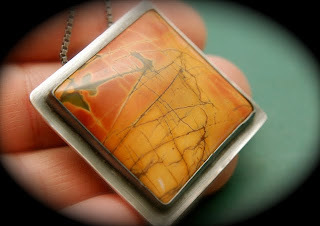 A picasso jasper necklace that I bezel set and oxidized to bring out the gorgeous color of the stone. This is a beautiful stone and I thought it would look best in a simple setting. 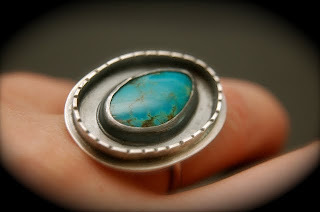 The other one is a shadow box ring featuring a stunning green-blue turquoise cabochon that is set in a pure silver bezel. For a more rustic look I added a textured band around the baseplate. 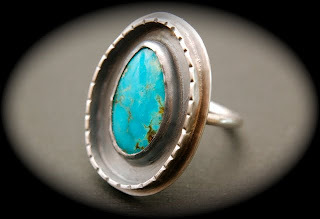 This ring is oxidized as well and given a nice smooth finish. I hope these two beauties will find their way in the hands of a new owner that will love them just as much as I do! P.S. I will have some pictures of Tromsø in the next couple of days!